Investors may be eyeing tax rates more than ever as federal and state governments continue to look for ways to raise revenues and regain solid financial footing. States, in particular, may experience pressure to raise taxes as they balance their own programs and revenues against the trickle-down effect from federal budget woes. Still, for individuals, no matter how high taxes may seem, someone in the next state may have greater bills to pay. Individual income taxes account for about 27% of state tax collections on average, according to the Tax Foundation, a research group. Most states have individual income taxes, but seven states have no income tax at all and two states — New Hampshire and Tennessee — only tax dividend and interest income. 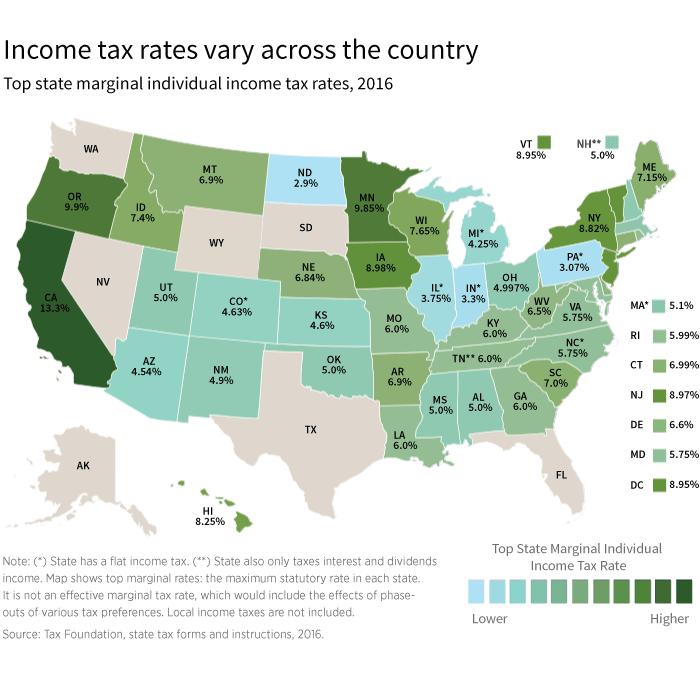 A recent report highlights the top marginal income tax rates by state. Whether you live in a relatively high- or low-tax state, or plan to move when you retire, it’s important to understand state taxes and how they can affect retirement plans. After all, no one wants to see his or her hard-earned savings shrink because of taxes. Taxes are an important consideration when making a permanent move to another state or choosing to own residences in multiple states. In general, an individual can only have one domicile or legal residence, but state laws vary, especially around income taxes. Some states will tax non-residents on compensation income earned in that state. If a house was sold prior to the move, some states require individuals to report capital gains. Laws also vary on whether Social Security and retirement plan distributions are taxable income. Asset protection laws vary by state. IRA assets may not be 100% protected from creditors, and some states offer varying degrees of home equity coverage, if at all, under Homestead Act rules. Also, now that the federal gift and estate tax exemption is over $5 million per person, many individuals are no longer planning for these taxes. State-based estate and inheritance taxes are still prevalent, and again, and the laws vary with geography. Tax-efficient planning may include Roth IRAs as a way to hedge against possible future tax-rate increases, as withdrawals in retirement are tax-free and there are no required minimum distributions. Younger investors or individuals in lower tax brackets may create a Roth IRA account as a source of tax-free income in retirement. For individuals with income that varies each year, completing a Roth IRA conversion when income is lower can be an advantage. Municipal bonds may be more attractive on a relative tax basis for taxpayers subject to the highest marginal tax rate. The tax equivalent yield — that is, the yield an investor would require in a taxable bond investment equal to the yield of a comparable tax-free municipal bond — has increased for those taxpayers. With recent projections of a rising federal budget deficit and with the political uncertainty from the presidential campaign, the future tax landscape is more unpredictable. Understanding the effect of state income taxes on financial planning is an important discussion to have with a professional advisor.